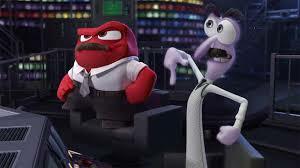 On Bluray this week from directors Peter Docter and Ronaldo Del Carmen along with Pixar Animation Studios and Walt Disney Pictures comes the complexities of INSIDE OUT. Riley (Kaitlyn Dias) is a little girl who lives with her father (Kyle MacLachlan) and mother (Diane Lane) in a Midwestern town. As she has grown up, we get to see her feelings from the inside with Joy (Amy Poehler), Fear (Bill Hader), Anger (Lewis Black), Disgust (Mindy Kaling) and Sadness (Phyllis Smith). Living inside Riley’s little mind call the Headquarters, they help her get through each day saving core memories and creating places for special memories. All begins to go a little whack-a-doodle when Riley’s Dad must uproot the family and move to San Francisco. Upset that she is leaving friends and hockey behind, Riley has a hard time finding her place in the big city. Poehler as Joy is so absolutely endearing. The ‘mama’ of the group, as we see her, she tries to keep everything going in a positive direction. Dealing with the other four can be a handful at times but it doesn’t stop her from being true to her name. Poehler lending her voice to Joy is just a absolute – well – joy! There is no one better to portray Anger than Lewis Black! We adore his comedy because he is that angry individual who says pretty much what most of us think. He is our unfiltered self and watching his head catch fire is hilarious. Hader as Fear fits his animated self. When he screeches we can’t help but laugh. Kaling as Disgust is just as hilarious because even when disgusted she is disgustingly funny, get it? Smith as Sadness has the voice down perfect. Bringing this character that just can’t seem to get it right teaches Joy a lesson that sometimes being sad needs to happen for us all to find our happiness. Dias as the voice of Riley is a little girl just trying to figure out her place in an ever changing world. Trying to be good isn’t easy at that age when such a big move means starting all over – again, relatable for us all. Other cast includes: Dave Goelz as Subconscious Guard Frank, Paula Poundstone as Forgetter Paula, Bobby Moynihan as Forgetter Bobby, Paula Pell as Mom’s Anger and Josh Cooley as Jangles. 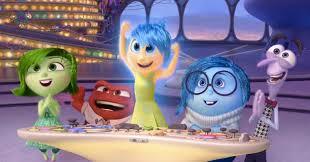 Disney Pixar has always and continues to bring amazing animation with stories that touch all our hearts. 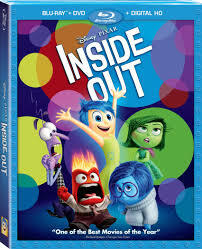 My own family entertainment collection would not be complete without INSIDE OUT and if you want to check out if your library is up to date, please visit http://www.disneystore.com. TUBS OF POPCORN: We give INSIDE OUT four and a half tubs of popcorn out of five. Two years ago we saw a bit of INSIDE OUT and in the little we saw in advance we were hooked and couldn’t wait to see how it would all come together and our excitement was well worth the wait. Once seeing the complete film in theatres, the next excitement was adding INSIDE OUT to our Disney home collection. This is such a delightful look at an entirely original idea that had us, as well as the audience, captivated from beginning to end. From serious laughter to sniffles and tears to moments of ‘awwwwww’ this is really a story of us all. Going through every emotion, everyone watching can relate and it doesn’t matter how old you are. The characters are relatable and seeing inside the parents head was pretty much past hilarious, especially inside Dad’s head and the blank expressions has this family’s women laughing out loud. 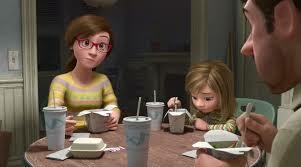 The animation is absolutely stunning, but then again we would expect nothing less from Pixar. The opening short LAVA is so incredibly cute we couldn’t stand it! All of Pixar’s shorts are loveable and heart tugging but this one really got to us and we lava LAVA too! Once again a family film that takes the word ‘family’ seriously so gather up everyone and hit the theatres this weekend to see what’s inside your head with INSIDE OUT. The Bluray includes an All-New Short, Riley’s First Date? and more. The bonus extras also include Story of the story, paths to Pixar: The Women of Inside Out, Mixed Emotions, Mapping the Mind, Our Dads the Filmmakers, Into the Unknown: The Sound of Inside Out and The Misunderstood Art of Animation Film Editing. In the end – come meet the little voices inside your head!